We provide a total e-learning training solution for ArcGIS, ArcGIS Pro, MapInfo Professional & QGIS users. Our e-learning is comprehensive, flexible and great value. GIS247 provides full training courses, sets of technical modules, invaluable presentations on GIS Essentials, a free accreditation program and management of users' learning paths. You can register for a free account to access our free GIS training section as well as gain access to our full Training Catalog via our full licences. GIS247 is a complete training solution for large & small organisations, user groups & individuals. It is delivered within our Learning Management System (LMS) that tracks user progress & permits your own training manager to effectively manage & target users' training programs. Access to our training is via licences, with 3 types available. ALL licences provide access to ALL courses of your chosen software. 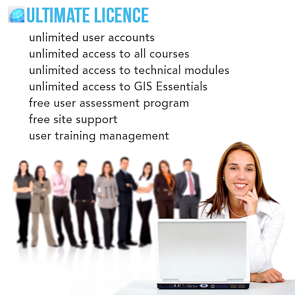 An Ultimate licence provides unlimited user accounts. A Set User licence offers up to 9 user accounts. 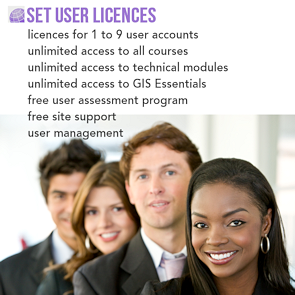 Individual GIS users can access ALL of our courses via a 1 user "Set User" licence. 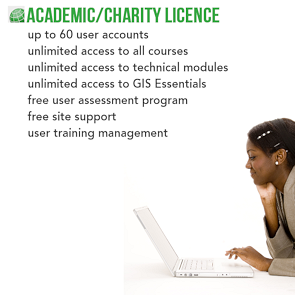 An Academic/Charity licence gives qualifying organisations up to 60 user accounts at a special rate. Each licence provides 12 months of unlimited access to all material for your chosen software. whether it be for 1 person, a small group or even an entire organisation, we have the solution. The perfect solution for organisations with more than 10 users. A flexible solution for individuals and groups of up to 9 users. There is more detailed information about GIS247 via What is GIS247? In order to comply with recent EU regulations we need to make you aware that when you access GIS247.com, a small file (a "cookie") is stored on your computer in order for us to recognise you and allow you to login. Continued use of GIS247.com assumes that you accept these conditions.